Trash cans are the cows of urban landscape. 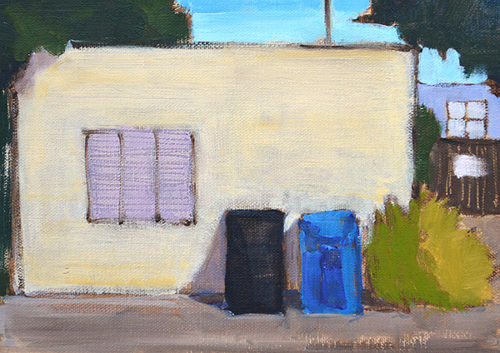 This entry was posted in Landscape Paintings, San Diego Paintings, Urban Landscapes and tagged 5 x 7 inches, alley, california, oil on linen on panel, san diego, trash can on October 4, 2017 by Kevin. 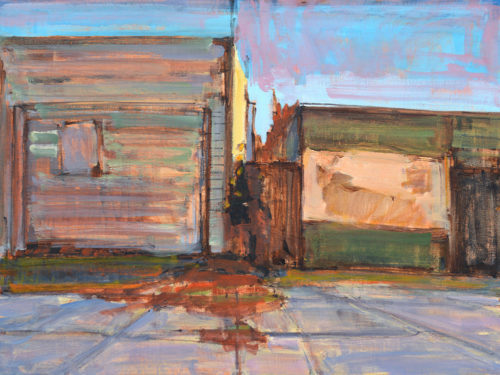 This entry was posted in Landscape Paintings, San Diego Paintings, Urban Landscapes and tagged 8 x 10 inches, landscape painting, oil on linen on panel, san diego, termite tent on September 29, 2017 by Kevin. Painted in the middle of the street, under the landing path to the airport. This entry was posted in Landscape Paintings, San Diego Paintings, Urban Landscapes on September 18, 2017 by Kevin. Some houses in the neighborhood. 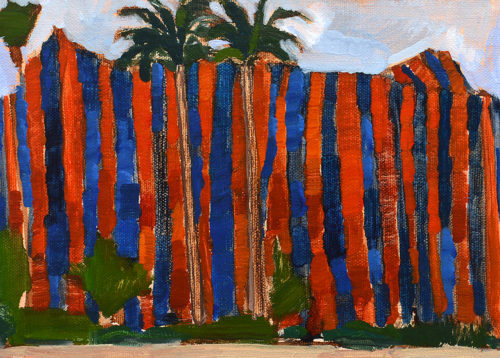 A palm tree in the neighborhood. 10 x 10 inches. 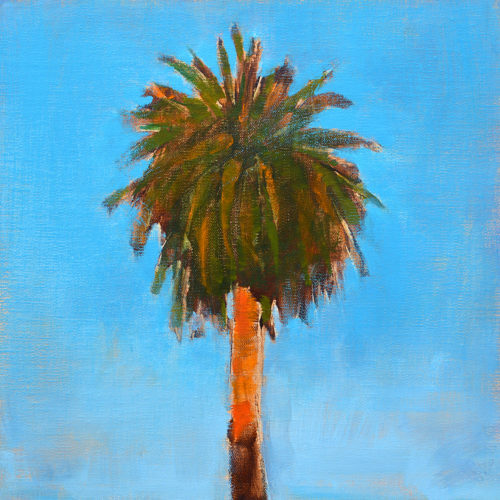 This entry was posted in Landscape Paintings, San Diego Paintings, Urban Landscapes and tagged 10 x 10 inches, california, california landscape painting, kevin inman, oil on linen on panel, palm tree, san diego on May 26, 2017 by Kevin. 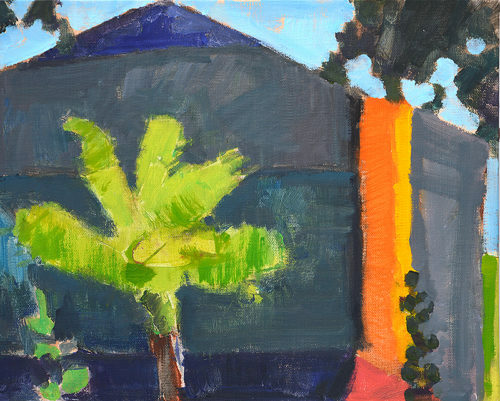 This entry was posted in Landscape Paintings, San Diego Paintings, Urban Landscapes and tagged 5 x 7 inches, landscape, oil on linen on panel, plein air, san diego, termite tent on May 9, 2017 by Kevin. I’m working on a series of pictures of this spot. It’s a hike from anywhere you can park. They’ve recently installed a 3 way stop here, which has had the weird effect of making the spot seem much busier than when it was just a stretch of 50 MPH road. It alternately smells like exhaust and like growing things. When I painted this one, the wildflowers were in full bloom. I went back today to do another piece as the landscape dries out and becomes the brown, gold, and tan of California summer. 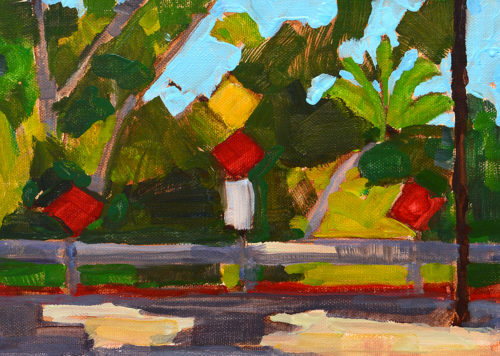 Both those plein air paintings are preparatory studies for larger pieces. 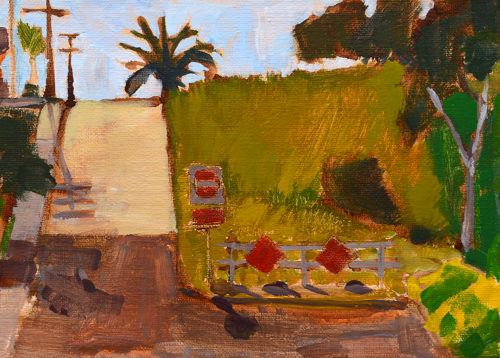 This entry was posted in Daily, Landscape Paintings, San Diego Paintings and tagged 5 x 7 inches, california, flowers, oil on linen on panel, san diego, yellow on May 2, 2017 by Kevin. Even successfully gave directions to a woman tangled in the maze of dead end streets while painting this. 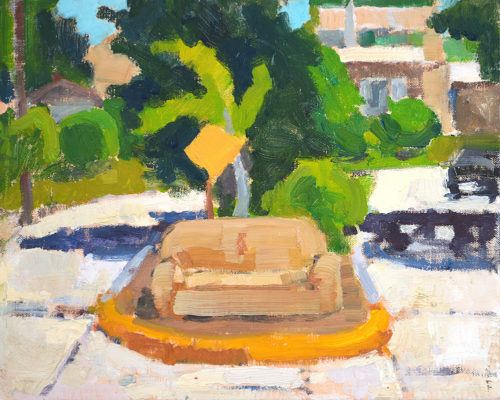 This entry was posted in Landscape Paintings, San Diego Paintings, Urban Landscapes and tagged 5 x 7 inches, grant hill, kevin inman, oil on linen on panel, plein air, san diego on April 28, 2017 by Kevin. We went to the Santa Ynez wine country for the weekend. My hope was to paint some scenic landscapes but I guess my heart wasn’t really in it and I wound up painting this. This was the town of Santa Maria, mostly just a string of strip malls with housing behind it, like so many small towns all over the United States. 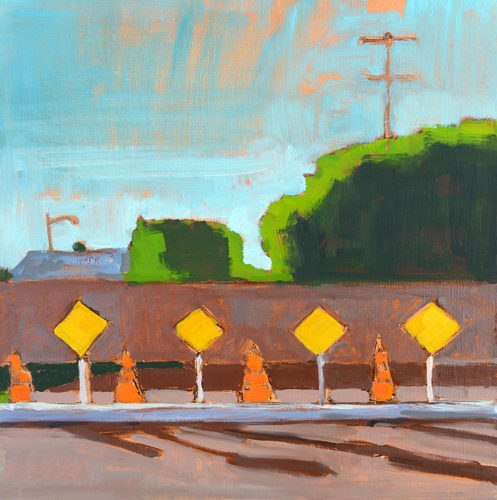 This entry was posted in Daily, Landscape Paintings, San Diego Paintings, Urban Landscapes and tagged 12 x 12 inches, california, oil on panel, san diego, santa ynez valley on April 26, 2017 by Kevin. Painted on location in Hillcrest. 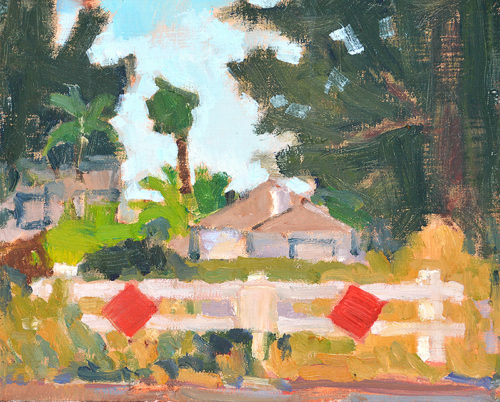 This entry was posted in Landscape Paintings, San Diego Paintings, Urban Landscapes and tagged 5 x 7 inches, california, kevin inman, oil on linen on panel, plein air, san diego on April 21, 2017 by Kevin. Painted on location in Banker’s Hill. 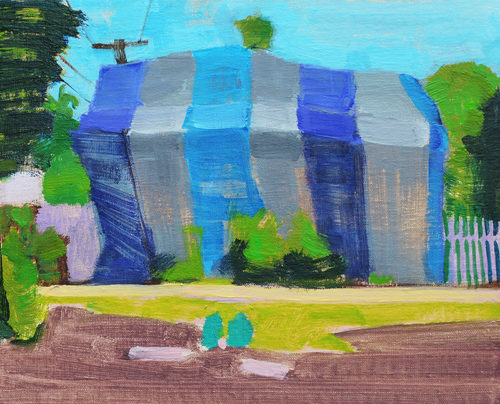 This entry was posted in Landscape Paintings, San Diego Paintings, Urban Landscapes and tagged 5 x 7 inches, fumigation, kevin inman, landscape, oil on linen on panel, san diego, tent, termite, termite tent painting on April 15, 2017 by Kevin. Please join us for wine and snacks. 7837 Girard Ave, La Jolla, CA. 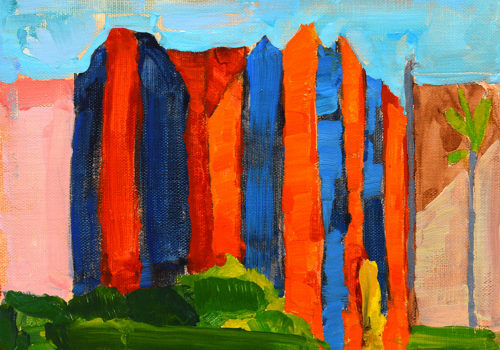 in conjunction with the Athenaeum School of the Arts. This spot is a few blocks from my place in Sherman Heights, a rapidly changing neighborhood overlooking the rapidly changing San Diego skyline. 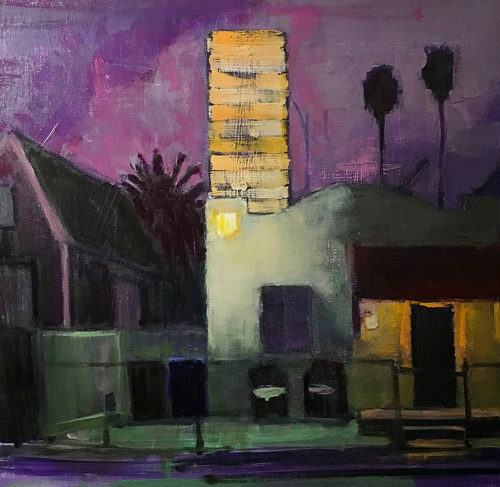 This entry was posted in Landscape Paintings, San Diego Paintings, Urban Landscapes and tagged 16 x 16 inches, california, city, kevin inman, landscape, night, oil on panel, palm tree, san diego on April 6, 2017 by Kevin.